Three-vehicle traffic accident near Dimona kills 2, seriously injures 1. A traffic accident near the Tzafit Junction on Saturday killed two people and injured three. 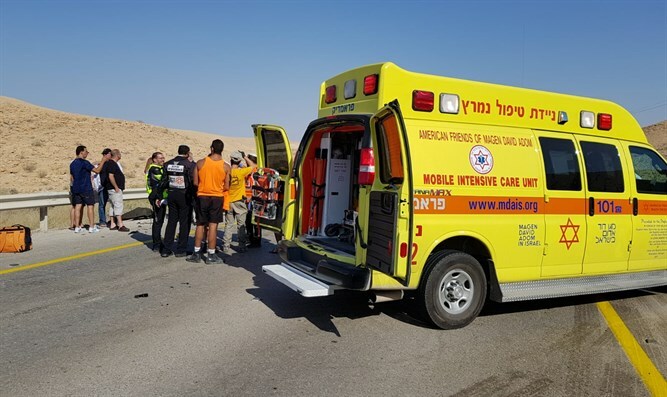 The accident, which occurred when three vehicles collided on Route 25 east of Dimona, left one person severely injured and two others with moderate and light injuries. According to 24DimoNews, one of those killed was a Bedouin and the other was a Jew. Other local reports claimed that one of the drivers involved was drunk at the time of the accident. Magen David Adom (MDA) paramedics provided medical treatment to the wounded, and transferred them to Be'er Sheva's Soroka Hospital. The severely injured victim, a man in his 20s, suffered injuries to multiple bodily systems and was semi-conscious. The victim who suffered moderate injuries, also in his 20s, suffered lesser injuries to multiple bodily systems, and is in stable condition. A third victim, in his 40s, was lightly injured. Two additional passengers were treated at the scene. MDA paramedic Orgad Cohen said, "We saw an upside-down vehicle in a ditch, and outside it were two youths lying on the ground. The driver was unconscious, had no heartbeat, and was not breathing. He had suffered injuries to multiple systems, and had no signs of life, and we were forced to declare his death." "On the road were two additional vehicles. In the passenger seat of one of them was a 60-year-old who had no signs of life, and after a medical examination we were forced to declare his death. We evacuated from the back seat a young person who suffered multiple system injuries and was conscious in moderate condition. The vehicle's driver, aged 40, was bruised."